The winner of the student division of Australia’s 2013 Gemini Astronomy Contest was Isobelle Teljega, who was in Year 8 at St. Margaret’s Anglican Girls School in the Brisbane suburb of Ascot, Queensland, Australia. Her entry was submitted for her by Chris Farrelly, who is the Head of Faculty – Science. The school’s Astronomy Club, which Mr. Farrelly supervises, had been a contest runner-up each of the previous two years. 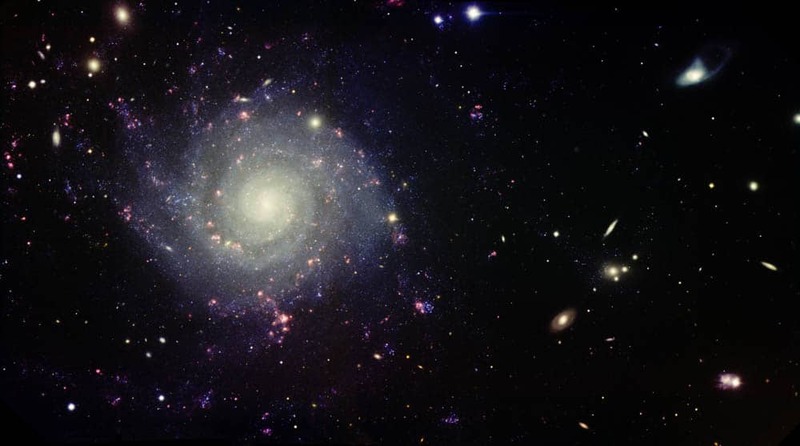 Isobelle’s contest entry had suggested that Gemini South obtain an image of the galaxy IC 5332, which is a large face-on spiral galaxy within the constellation Sculptor. In addition, the image contains a cluster of galaxies in the distant background. IC 5332, also known as PGC 71775 is a spiral galaxy about 39 million light-years away in the constellation Sculptor. IC 5332 is a delicate spiral galaxy that is unusually faint and beautifully symmetrical. As viewed from earth it is nearly face on. It has a very small central bulge and open spiral arms accounting for its classification (Sc). The galaxy lies in the direction of the celestial south pole. IC 5332 is a late type spiral galaxy with observable star formation ongoing, though at such a low rate as to be a stable non-starburst galaxy. It is a somewhat tenuous spiral galaxy with a very low surface brightness of just 23.8 mag/squ arc sec.